Doctors may be unsure if the pain starts in the joint or in its surrounding ligaments. Ligaments are bands of tissue that connect one bone to another bone. It is also difficult to tell if the pain is coming from the sacroiliac joint or the small joints in the lower spine. These smaller joints are called facet joints. The doctor will ask about your symptoms and medical history. A physical exam will be done. 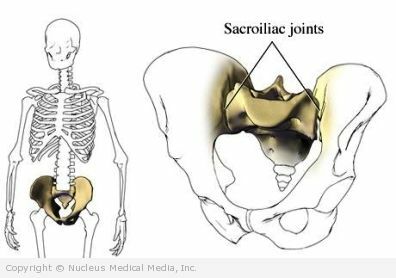 Finding the source of sacroiliac joint pain is often difficult. Tests depend on your medical history and the suspected cause. Treatment depends on the cause of the pain. Any underlying condition would receive treatment specific for that disease. For stress fractures, doctors recommend limited weight-bearing. Regardless of the cause, short-term rest is often advised. Exercise regularly to keep muscles strong. Use proper techniques for bending or lifting.